ALL of the cost me a tiny £6.65! The Wilkos shower smoothies smell good enough to eat, I picked up the fruity one and honey and vanilla, they cost 50p each!!! I usually stock up on their 30p face wipes however I noticed they had tea tree deep cleansing facial wipes for 50p per pack so I thought I would give them a whir as well as grabbing some cotton pads as always for 70p and my favourite Palmolive deodorant for £1.00l! The shower scrunchies things, yes that is the real name, well to me it is, cost 10p EACH!!! I always have a lip balm at my desk at work and I picked up a pack of three in scents watermelon, grape and strawberry all three for 50p. I also picked up a nail file, again for my desk for £1.00 and an eyeliner brush (which I have been using for my brows) again for £1.00!! I them noticed they had pencil cases reduced and thought this pink stripey one would be great for putting my makeup brushes in while travelling and this was a bargainous 25p! 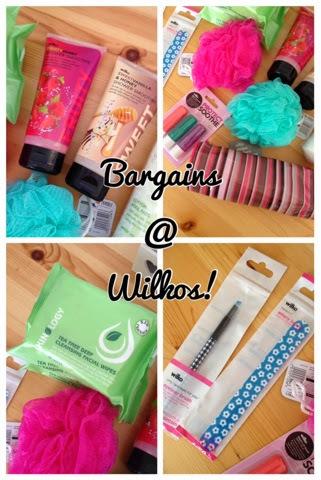 If you have a Wilkos near you go and grab some bargains before they are all gone!!! Hmmm don't think I've ever thought to go to wilko's for beauty stuff. I hear they now have essence.